Barnyard Bonanza slot is set in a rustic setting with farm animals and machinery all on display. The subject is very similar to that of RTG's Triple Twister and Netent's Tornado Farm Escape and is equally as infantile as the latter slot too. We get the Ainsworth trotting noise as the reels spin which for once actually matches the theme and not unexpectedly some silly animal sounds if for example you get a win consisting of pigs or hens. 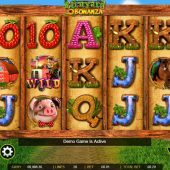 Will Barnyard Bonanza slot serve you up a rich harvest or simply prove to be manure? Like their Thunder Cash game we get 20 pay lines over 5 reels of 3 rows and like that game the pays aren't exactly spectacular. You pay 20 coins a spin and Farmer Wilds appear singly on all reels paying only 125 coins for all 5, followed by Cow, Horse, Pig, Scarecrow and Barn paying 80 coins down to 55 respectively. There are the usual Ainsworth card values too paying 45 down to 25 coins and the best pay by far is getting the 5 Chicken scatters as these will pay 100x bet although only three are needed to trigger a free games bonus. You also see Golden Eggs on the reels and should one stop in view you get 1 to 5x bet or 1, 2 or 3 extra spins. No proper retrigger is available.